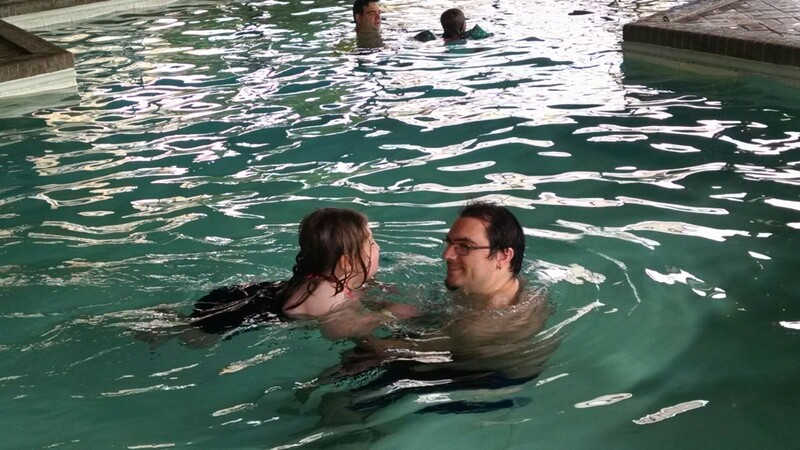 While we were in Indiana for Jessica’s cousin’s wedding, we got a chance to go swimming in our hotel’s pool. We had kind of lucked out, when we had gone shopping for a swimsuit. Not only did we find a cute one-piece for Namine, but we also found a nice skirt and t-shirt that can serve as kind of a coverall to keep her from getting cold. When she put on her swimsuit, she noticed in the mirror that her chest scar was showing. She didn’t sound worried, it was just kind of a huh, that’s interesting tone of voice. I asked her if it was okay that people could see her scar. Our hotel had two avenues for swimming: a regular pool; and a splash pad, where the water was extremely shallow for little kids to explore on their own (with supervision, of course). Namine wanted to check out the splash pad first. I followed Namine around, but left her alone for the most part. I helped her when she asked for help, and encouraged her to do what she could on her own. Namine remembered the last time she visited a splash pad, and how she’d scraped up her ankle pretty good. This time around, she was more careful of her ankle. Unfortunately, by changing the way she got around, she scraped up the top of her left foot, instead. After bandaging Namine’s foot, we went over to the regular swimming pool. She practiced her kicking and paddling as I walked around the pool with her.